cardamom recipe collection. elaichi Indian reicpes. Cardamom is a spice that most predominantly grown in India (where it is known as Elaichi) and Indonesia. Being one of the most ancient spices in the world, it is sometimes referred to as the queen of spices and is also considered to be one of the most expensive spices around the world. There are 2 types of cardamom – green and black. The green one has an outer shell with small seeds inside it. Adding cardamom to your food gives it a royal touch because of the different aroma and taste it brings to the dish. The best thing about elaichi is that even a little goes a long way. The spice is so strong that even a pinch makes a world of difference to the food. Saffron and nutmeg together with cardamom makes the ultimate trio of spices, especially for Indian Desserts. Whether it's a dry sweet like Amrit Peda or a something like Basundi, cardamom goes with both. Even though used in so many types of sweets, it reacts differently and does not let any two desserts taste the same. The most known dessert with cardamom would be the Indian response to ice-cream – Malai Kulfi – which is made with simple ingredients milk, condensed milk and corn flour. Moreover, cardamom is also preferred as a garnish over certain sweets like Jalebis. This shows the versatility of cardamom in dessert preparation. In India, cardamom forms a part of the masala spice mixture that is used in daily cooking. An array of Punjabi dishes and vegetable subzis used either whole pods or ground cardamom to flavor their dishes. Just like Indian desserts have a trio of spices, in Indian savory food there is – cardamom, cinnamon and cloves. Paneer makhani, the most quintessential Punjabi dish, flavors itself with these wholes spices. This wonderful trio is also used in Dal Makhani. Cardamom does not limit itself to Punjabi flavors, it is used in Mughlai, Maharashtrian and even south Indian food. Adding whole spices to Mughlai Vegetable Briyani lifts the whole flavor of the dish. A traditional Maa ki Dal also has a hint of cardamom in it but not enough to overpower the other tastes. While whole cardamom pods are used in vegetable dishes with gravies, cardamom powder is used in dry subzis and also in kebabs. Elaichi is an important ingredient in Masala Chai. A steaming cup of masala chai is what every Indian loves the most. Another drink where cardamom is famous is Kashmiri Kahwa. It is also used in to make sweet parathas called Puran Polis, to cut through the sweetness of it. Combining peppercorns, chili, cloves, cumin etc with cardamom makes a tasty Lebanese Spice powder called Baharat. Not only is it used in Indian sweets but also used all around the world to make different types desserts like this Almond Pistachio Praline Triangles. Cardamom is one such spice where it is impossible to list down all the recipes it is used in and hence we have provided a gist of it above. If you want to know more about the Uses of Cardamom, then you can check out our article on that. 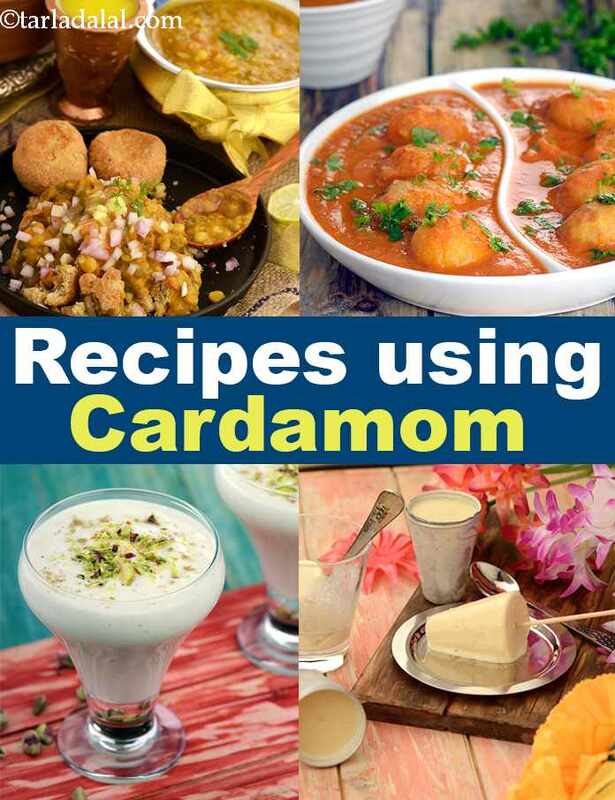 Look here for cardamom powder recipes. Enjoy the cardamom recipe collection, elaichi Indian reicpes, scroll down below for more.